THE FOLLOWING MAP IS NOT TO BE USED FOR NAVIGATIONAL PURPOSES. 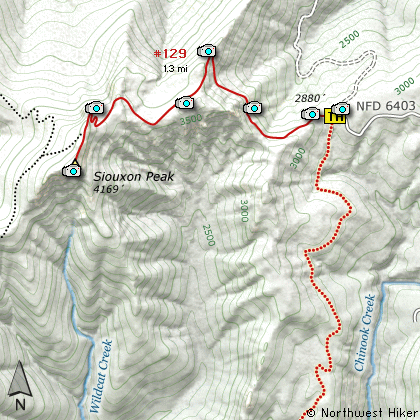 Siouxon Peak is a steep but rewarding hike. A hiker can reach this summit via several routes, but this CD will examine only 2. The easiest option is to drive to the end of Forest Road 6403 where you are faced with a mere 1.3 mile hike to the top. The other option on this CD is to come from the Siouxon Creek valley. Climbing Siouxon (pronounced Sue-sawn) is a difficult task regardless of which trail head you select. If you begin your hike at the Siouxon Creek trail head, you have first to hike up Siouxon Creek for about 4 miles before you begin the arduous task of climbing out of the valley to the upper trail head, then climbing to the top. In order to reach Siouxon Peak from the creek, you are faced with wading across Chinook Creek, which at best is knee deep and about 50 feet across. Chinook Creek Falls is beside you, creating a beautiful scene to enjoy while you negotiate the creek. It would be wise to carry some wading shoes with you on this hike. As soon as you cross the creek, the trail gets very steep and remains that way for about a mile. Eventually the trail follows an old logging road and is far more level. At about 3 miles you will come to the other optional trail head. At this point you begin to hike the last 1.3 miles and climb nearly 1300'. The trail continues to follow an old logging road that was used to access the fire lookout tower that used to be on top of Siouxon Peak. It is this last part of the hike that you get really outstanding views of the surrounding valleys and mountains. Mt Adams to the east, Mr Rainier to the north, and Mt St Helens to the northwest are viewed along this part of the hike. At about a mile from the 2nd trail head, the trail leaves the old road bed and climbs steeply to the north side of the peak, then follows around to the west side where it finally climbs to the top. 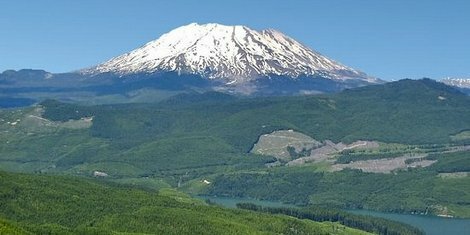 Trees on the northwest side of the peak prevent you from seeing Mt St Helens from the top, but views to the north, east, and south are outstanding. From Portland, travel east on Interstate Hwy 84 to Exit 44 to Cascade Locks. Exit the freeway and cross over the Columbia River into Washington via the Bridge of the Gods. Then turn right, or east, and head east through Stevenson, Washington to the intersection of the Wind River Highway to Carson, Washington. Bear left onto the Wind River Highway which will take you through Carson, Washington. From Vancouver, WA travel east on SR14 through Stevenson, Washington to the intersection of the Wind River Highway to Carson, Washington. Bear left onto the Wind River Highway which will take you through Carson, Washington. Continue north on the Wind River Highway (FR30) for about 8.6 miles to the little community of Stabler and the junction with Forest Road 43, also called Hemlock Road. Continue northwest on FR30 for another 5.4 miles and you will pass a fish hatchery on the left. Continue on another half mile and you will come to the junction with Forest Road 3065, which continues straight ahead. Bear right and continue on SR30 for another 2.1 miles to the junction with Forest Road 64. Bear left onto FR64 and climb steeply for another 6 miles to the junction with Forest Road 58. Bear right at this junction and stay on FR64. This part of the road is becoming almost impassable. The trees and bushes are growing in on both sides, so don't take a vehicle that you don't want scratched. It is about 7 miles from this junction with FR56 to the parking area and trailhead for this hike. Somewhere along this difficult part of the drive, you will turn onto Forest Road 6403. Follow it to the end.